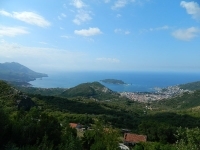 One of the European tourist scene's best-kept secrets is surely the Budva Riviera, a 22-mile (35km) strip of Adriatic coastline surrounding the town of Budva on Montenegro's west coast. For most people, Montenegro does not immediately spring to mind when considering ideal destinations for a beach holiday in Europe, but for those in the know, it provides the perfect setting for a holiday filled with sun and surf. The Budva Riviera is the heartbeat of Montenegro's tourism industry, attracting 300,000 visitors in 2010, only to rise as word gets out of its spectacular jagged coastline, which is home to bays, inlets, caves, small islands, and more than 20 beaches - not to mention a vibrant nightlife and plenty of sophisticated restaurants, cafes and bistros. Tourists looking for a piece of sand to call their own will be spoilt for choice, but highlights include Jaz Beach, Mogren Beach, which gets the most sun, Milocer Beach, which is surrounded by woods filled with rare tree species, including Lebanese cedar, and Becici Beach, the most famous of Montenegro's beaches, and winner of the 1935 Grand Prix prize for most beautiful beach in Europe.